The age of haplogroup U5 is uncertain at present. It could have arisen as recently as 35,000 years ago, or as early was 50,000 years ago. U5 appear to have been a major maternal lineage among the Paleolithic European hunter-gatherers (known as Cro-Magnons), and even the dominant lineage during the European Mesolithic. In two papers published two months apart, Posth et al. 2016 and Fu et al. 2016 reported the resultts of over 70 complete human mitochondrial genomes ranging from 45,000 to 7,000 years ago. The oldest U5 samples all dated from the Gravettian culture (c. 32,000 to 22,000 years before present), while the older Aurignacian samples belonged to mt-haplogroups M, N, R* and U2. Among the 16 Gravettian samples that yieled reliable results, six belonged to U5 - the others belonging mostly to U2, as well as isolated samples of M, U* and U8c. Two Italian Epigravettian samples, one from the Paglicci Cave in Apulia (18,500 ybp), and another one from Villabruna in Veneto (14,000 ybp), belonged to U5b2b, as did two slightly more recent Epipaleolithic samples from the Rhône valley in France. U5b1 samples were found in Epipalaeolithic Germany, Switzerland (U5b1h in the Grotte du Bichon) and France. More 80% of the numerous Mesolithic European mtDNA tested to date belonged to various subclades of U5. Overall, it appears that U5 arrived in Europe with the Gravettian tool makers, and that it particularly prospered from the end of the glacial period (from 11,700 years ago) until the arrival of Neolithic farmers from the Near East (between 8,500 and 6,000 years ago). Carriers of haplogroup U5 were part of the Gravettian culture, which experienced the Last Glacial Maximum (LGM, 26,000 to 19,000 years ago). During this particularly harsh period, Gravettian people would have retreated into refugia in southern Europe, from which they would have re-expanded to colonise the northern half of the continent during the Late Glacial and postglacial periods. For reasons that are yet unknown, haplogroup U5 seems to have resisted better to the LGM to other Paleolithic haplogroups like U*, U2 and U8. Mitochondrial DNA being essential for energy production, it could be that the mutations selected in early U5 subclades (U5a1, U5a2, U5b1, U5b2) conferred an advantage for survival during the coldest millennia of the LGM, which had for effect to prune less energy efficient mtDNA lineages. It is likely that U5a and U5b lineages already existed prior to the LGM and they were geographically scattered to some extent around Europe before the growing ice sheet forced people into the refugia. Nonetheless, founder effects among the populations of each LGM refugium would have amplified the regional division between U5b and U5a. U5b would have been found at a much higher frequency in the Franco-Cantabrian region. We can deduce this from the fact that modern Western Europeans have considerably more U5b than U5a, but also because the modern Basques and Cantabrians possess almost exclusively U5b lineages. What's more, all the Mesolithic U5 samples from Iberia whose subclade could be identified belonged to U5b. Conversely, only U5a lineages have been found so far in Mesolithic Russia (U5a1) and Sweden (U5a1 and U5a2), which points at an eastern origin of this subclade. Mesolithic samples from Poland, Germany and Italy yielded both U5a and U5b subclades. German samples included U5a2a, U5a2c3, U5b2 and U5b2a2. The same observations are valid for the Neolithic and Chalcolithic periods too, with U5a1 being found in Russia and Ukraine, U5b in France (Cardium Pottery and Megalithic), U5b2 in Portugal. Once again, both U5a and U5b were found in Germany, although with a much higher proportion of U5b this time - especially U5b2a, which was found both among farmers and fisher-gatherers. What's interesting is the appearance of isolated U5a1 samples in Catalonia and Portugal, both circa 3000 BCE, which could be a sign of an Eastern European migration, and maybe even the arrival of a few isolated Proto-Indo-European tribes from the Pontic Steppe. Mesolithic Europeans would have belonged essentially to Y-haplogroup I, while R1a and R1b were present mostly in eastern Europe. The rare Y-haplogroup C1a2, descendent from the Aurignacian Cro-Magnons, was also identified. Five Mesolithic U5 samples, all dating from c. 8,000 years ago, were tested for both mitochondrial DNA and Y-chromosomal DNA. An individual from leon in northern Spain belonged to mtDNA U5b2c1 and Y-DNA C1a2 (Olalde et al. 2014). Another one from Loschbour in Luxembourg belonged to mtDNA U5b1a and Y-DNA I2. Three men from Motala in southern Sweden belonged respectively to U5a1 and U5a2 and to Y-haplogroups I2 and I*, possibly pre-I1 (Lazaridis et al. 2013). U5b1b1 arose approximately 10,000 years ago, over two millennia after the end of the Last Glaciation, when the Neolithic Revolution was already under way in the Near East. Despite this relatively young age, U5b1b1 is found scattered across all Europe and well beyond its boundaries. The Saami, who live in the far European North and have 48% of U5 and 42% of V lineages, belong exclusively to the U5b1b1 subclade. Amazingly, the Berbers of Northwest Africa also possess that U5b1b1 subclade and haplogroup V. How could two peoples separated by some 6,000 km (3,700 mi) share such close maternal ancestry ? The Berbers also have other typically Western European lineages such as H1 and H3, as well as African haplogroups like M1, L1, L2 and L3. The Saami and the Berbers presumably descend from nomadic hunter-gatherers from the Franco-Cantabrian refugium who recolonised Europe and North Africa after the LGM. The journey of U5b1b1 didn't stop there. The Fulbe of Senegal were also found to share U5b1b1b with the Berbers, surely through intermarriages. More impressively, the Yakuts of eastern Siberia, who have a bit under 10% of European mtDNA (including haplogroups H, HV1, J, K, T, U4, U5 and W), also share the exact same deep subclade (U5b1b1a) as the Saami and the Berbers. The Bronze Age shows a different picture. U5a1 (mostly U5a1a) suddenly supersedes U5b in Germany in remains from the Corded Ware and Unetice cultures, both linked with the advance of Indo-Europeans speakers from the Pontic Steppe in southern Russia and Ukraine. U5a1 also turns up in the Andronovo culture in southern Siberia, another culture linked with the Indo-European migrations. U5a1a was also found in elite graves from Mycenaen Greece, the period associated with the introduction of the Proto-Greek branch of Indo-European languages into Greece. Wilde et al. (2014) tested mtDNA samples from the Pontic-Caspian Steppe dating from the Chalcolithic and Early Bronze Age (Yamna culture and Catacomb culture) and found U5a1 in samples from all periods, confirming that this maternal lineage was found among the original Proto-Indo-European speakers. Iron Age remains tell the same story. U5a1/U5a1a shows up in an Indo-European kurgan burials from Kazakhstan (Lalueza-Fox et al. 2004) and from Khakassia in the Altai (Keyser et al. 2009), in kurgans from the Scytho-Siberian Pazyryk culture in Mongolia and southern Siberia (Pilipenko et al. 2010), in Scythian and Scytho-Sarmatian remains from Ukraine (Nikitin et al. 2011) and southern Russia (Dersarkissian 2011), and even in the classical Celtic La Tène culture in southern Germany (Knipper et al. 2014). U5a1a therefore appears very strongly correlated with the Indo-European migrations during the Bronze Age and the Iron Age. More amazingly U5b was never found in any kurgan burial or other Indo-European remains in Asia, which means that the U5b samples from the Corded Ware, Unetice or Urnfield cultures in central Europe could represent the lineages of the indigenous inhabitants of the region who were absorbed by the Indo-European invasions. Another possibility is that U5a1a is associated with the R1a branch of the Indo-Europeans, and that other varieties of U5 would have been carried by R1b people. 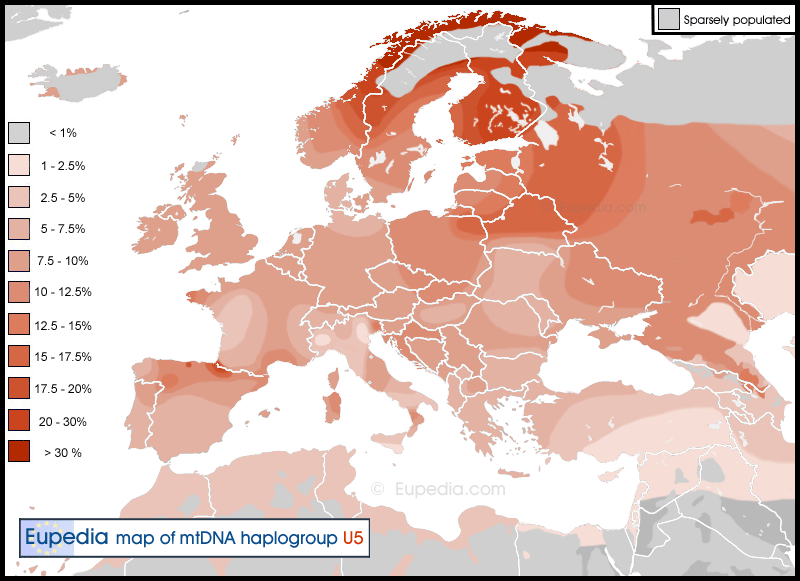 It is noteworthy that of the two Indo-European branches only Y-haplogroup R1a was found in the above remains from Eastern Europe, Central Asia and Siberia. Consequently the only conclusion that can be drawn from them is that U5a1a is linked to R1a. But could it also be associated with R1b ? Although European DNA found in Central Asia and Siberia is almost always of Indo-European origin, most countries have mixed R1a-R1b populations, making it difficult to distinguish maternal lineages between the two. The Tajiks are an exception. They possess 30% of R1a and only 3% of R1b, which makes it the only clearly R1a-dominant region in Central Asia or Siberia. Tajikistan also happens to be the Asian country with the highest percentage of U5 (7.5%), and most of it is U5a1, with a small minority of U5b1c. This confirms again the association between U5a1 and R1a. There is strong evidence that R1b people also carried U5 maternal lineages, but perhaps not so much of the U5a1 variety, or at least not as overwhelmingly as R1a people. Several U5 subclades other than U5a1a have been found in Central Asia, including U5a2a, U5b1c2, and U5b2a (U5b2a1, U5b2a2, U5b2a4 and U5b2a5). Although these were probably brought by the Indo-Europeans, it remains unclear whether they are linked to R1a or R1b people. U5b1: found in northwest Africa, western, central and north-east Europe, Central Asia and Siberia / found in Epipalaeolithic Germany, Switzerland and France. U5b1b1d: found in Spain and Italy. U5b2b: found in Epigravettian Italy, in Epipalaeolithic south-eastern France, in Mesolithic Croatia, and in Neolithic Croatia and Ukraine. Rollins et al. (2009) examined the association between brain pH and mtDNA alleles. The highest brain pH was found in members of haplogroups U and K. Higher pH confers protection against Parkinson's disease and psychiatric disorders such as schizophrenia, bipolar disorder, and major depressive disorder. Another study by the University of Manchester suggests that a lower brain acidity (i.e. higher pH) has a protective effect against strokes. Research on intelligence point that people with higher IQ tend to have more alkaline brains. Higher pH is associated with better conductivity-transmission between neurons (source). Hendrickson et al. (2008) studied the role played by mitochondrial function in AIDS progression in HIV-1 infected persons. They found that AIDS progression was slower for members of haplogroups U and K, except for U5a which had a faster progression. The common C150T mutation has been found at strikingly higher frequency among Chinese and Italian centenarians and may be advantageous for longevity and resistance to stress according to Chen et al. (2012). C150T defines haplogroups U5a1h and U5b, but may also be found among other subclades. Montiel-Sosa et al. (2006) studied sperm motility and vitality within members of haplogroup U and K in Spain and found that the highest motility and vitality was found within haplogroup U5b and the lowest among haplogroup U4. The Cheddar Man (subclade U5a): the remains of a Mesolithic man found in Gough's Cave in Cheddar Gorge, Somerset, England. It is Britain's oldest complete human skeleton.